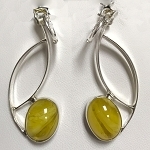 3-D Jewelry - This is a handcrafted brilliant contrast of textured and high polished sterling silver pendant that features a chunky freeform yellow Copal Amber cabochon (33mm x 28mm), fossilized tree sap, from Tanzania. This One-of-a-Kind comes with an 18" sterling silver snake chain. From our "Textured Silver" Collection, this is a handcrafted sterling silver pendant created from textured curves of silver and round silver tubes. 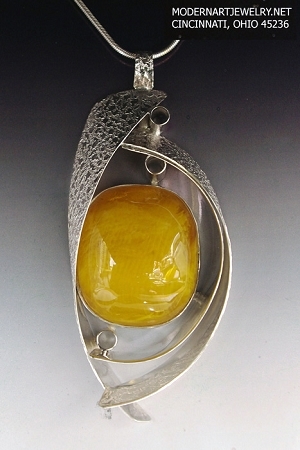 The three dimensional pendant features a chunky freeform Copal Amber cabochon. 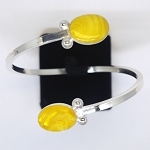 Copal Amber, fossilized tree sap, is from Tanzania and is a younger Amber than the Baltic Amber. This pendant is a One-of-a-Kind. This One-of-a-Kind pendant measures 3.6" long x 1.5" wide. 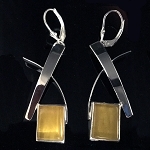 The Copal Amber is approximately 1.3" long x 1.1" wide (33 mm x 28 mm). Bail is 8 mm for chain versatility.